Empty nip bottles line the sidewalk of Tremont St. and other areas of Boston following the Red Sox World Series Parade in late-Oct., 2018. Recently, the city of Chelsea became the first city in Massachusetts to completely ban the sale of “nips,” the small, typically 50mL shots of alcohol, according to the Boston Globe. However, this restriction is not unique to Massachusetts. The city of Chicago has banned the sale of nips and other small quantities for alcohol for several years. Many believe that banning nips will help combat the public intoxication and littering issues that have become a considerable problem for Boston and surrounding cities like Chelsea. Others feel that banning these small bottles restricts consumer choice and hurts local retailers. While the intentions behind the Chelsea nip ban are good, enacting a complete ban of nips is unnecessarily restrictive. In order to protect responsible consumers while still addressing the issues of public intoxication and litter that nips cause, it would be best to reduce the accessibility of nips rather than ban them altogether. Rather than completely banning the sale nips, cities should model what Boston is doing and restrict where they can be sold. When granting a liquor store license, the Boston Licensing Board can impose a condition, completely at their discretion, that no nips or single containers of beer be sold on the premises. This allows the city to prohibit nips and small amounts of alcohol in areas in which they feel are prone to have high levels of public intoxication without completely denying consumers access to the products. For example, many stores in populated areas like Downtown Crossing do not sell nips, while in more residential areas like Beacon Hill, nips can be purchased. Seen as a discreet way to drink in public spaces, nips are often considered a gateway to public intoxication. Due to their easily disposable nature combined with the small and concealable size, nips are the ideal medium to inconspicuously consume alcohol in public. Additionally, the convenience and relatively cheap price of nips make it readily available to the homeless population, which has very high rates of substance abuse and alcoholism. Yet for some people, nips provide a portion controlled amount of alcohol, which helps them drink in moderation. While some argue that it may be inconvenient that you have to travel a bit farther to get nips, regulating where they are sold is ultimately for a better cause. By making it harder for the general public and homeless population to access nips and other cheap, small amounts of alcohol, the number of public intoxication incidents will hopefully decrease. This method also still provides responsible consumers with the option of purchasing nips should they desire. The prevalence of empty nip bottles on the streets and in parks also makes them a prominent source of litter. 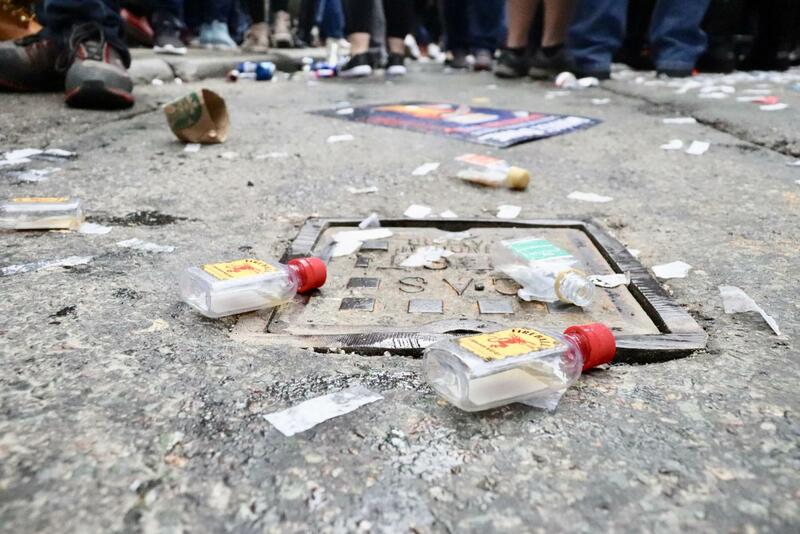 In the days following this year’s Red Sox victory parade, the small plastic bottles could be found up and down Tremont Street. “Wicked Local Plymouth” recently reported that locals collected more than 500 empty nips from one road in Plymouth, Massachusetts over a six month period. To help combat the littering issue of nips, Massachusetts should place a five-cent deposit on nips, which would encourage people to properly recycle the plastic bottles. Last year, Representative Randy Hunt of Sandwich introduced a bill to impose the statewide deposit, but it did not pass. In recent years, many states and towns have unsuccessfully tried to ban nips. In 2017, Maine attempted to ban the sale of nips for the entire state. The measure was denied by the state Liquor Commission, who felt that the ban would greatly impact consumer choice and hurt local businesses. Similarly, Everett and Winthrop have both attempted to ban nips, these measures have been unable to successfully pass due to questionable legality and pushback from the liquor industry. In this multifaceted issue, taking a hard stance does not seem to be the answer. Rather than ban their sale altogether, regulating where nips are sold and providing a recycling incentive are more balanced ways to help solve public intoxication and littering problems.